Katherine Rodgers has struggled with mental illness her entire adult life and has been in and out of prison. Last fall she enrolled in a program designed to help people like her become more independent and stable. 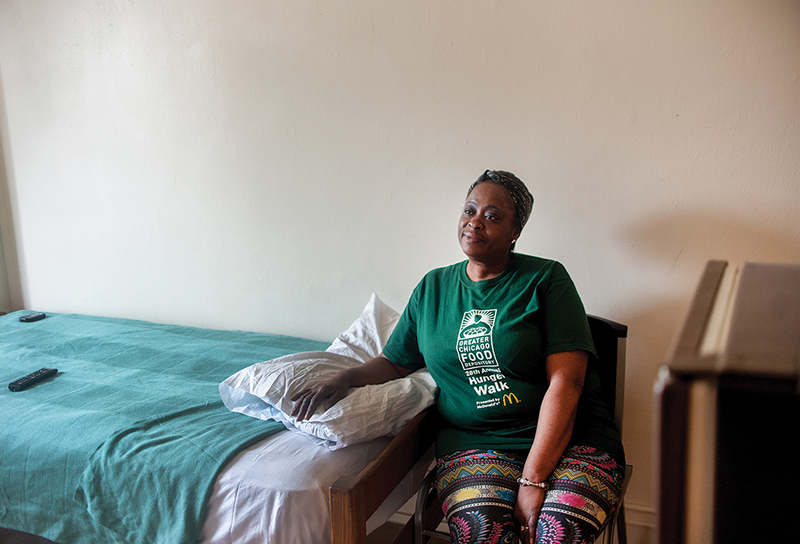 Home for Katherine Rodgers is a small room with cream-colored walls in a single-room occupancy hotel in Chicago’s Uptown neighborhood on the North Side. The room in the SRO represents progress for Rodgers, after an adulthood struggling with mental illness. Her previous “residences” have included Cook County Jail and three Illinois prisons. It has taken 30 years — and lots of support — for Rodgers, who turns 50 in April, to turn her life in a positive direction. She says her life took a detour at 18 when she made a series of bad decisions after leaving her strict parents’ North Lawndale home. She started drinking and using drugs. She got hooked on heroin. She started relying on questionable men for drugs and a place to live. Extreme mood swings led to a psychiatric hospitalization at the now-shuttered Tinley Park Mental Health Center, where she was diagnosed with bipolar disease at age 19. Eventually her addiction led to conviction for drug possession and charges related to writing bad checks. Rodgers learned she had schizophrenia when she was incarcerated at Decatur Correctional Center in 2011. At bond court last October, where she arrived directly from Cook County Jail, a staff member from the social service agency Thresholds approached her and asked about her plans if she were released from custody. Rodgers didn’t have any — she didn’t have any income or place to live. So when the staff member told her they could evaluate her eligibility to become a client, Rodgers crossed her fingers. Last fall Thresholds launched a program to identify people living with serious mental illness who pass through bond court, a point of intervention for linking those people to a range of services that can help them become more independent and stable. Thresholds made sure she had a psychiatrist and helped her get medications, Social Security disability income and a roof over her head. Her struggles aren’t over, however. She continues to hear voices at times, a symptom of her schizophrenia. She has a pending legal case for drug possession. She requires treatment for insomnia, diabetes, high blood pressure and high cholesterol. And she takes a synthetic hormone, Levothyroxine, because she is a survivor of thyroid cancer, which was diagnosed when she was incarcerated at Decatur. She is taking methadone to prevent drug cravings, but she has had lapses in the past where she’s returned to heroin. Even so, she has come a long way. At least there is a glimmer of hope. This story was produced as part of the Social Justice News Nexus, an initiative at Northwestern University’s Medill School of Journalism that brings together reporters, community watchdogs and journalism students to cover issues that affect Chicago. Learn more at sjnnchicago.org. The Social Justice News Nexus is supported by the Robert R. McCormick Foundation.